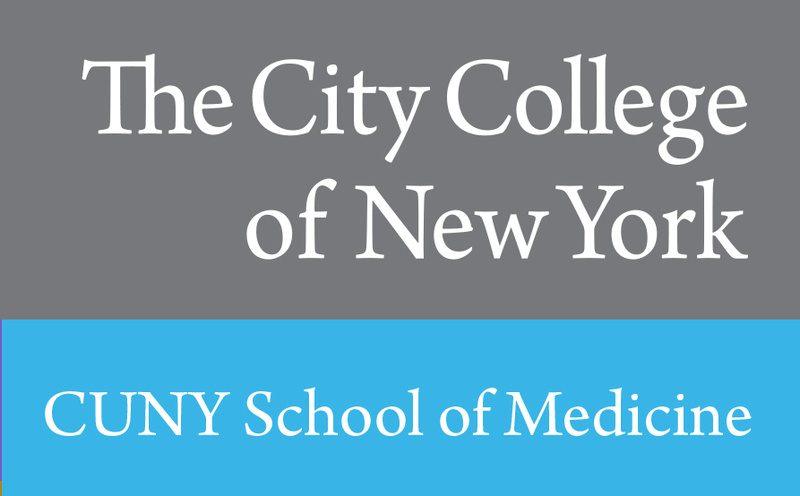 A 53-year-old male with no past medical history came to the emergency department complaining of abdominal pain in the epigastric area and right upper quadrant, associated with chills, fever, fatigue, decreased appetite and constipation for 10 days. Patient was born and raised in Ecuador, moved to the United States 11 years ago. Recent travel to Ecuador 5 months prior to admission for 1 month. Drinks 6 beers daily x 10 years. No tobacco or illicit drug use. On review of systems he denied diarrhea, recent surgery, gallbladder disease, trauma and previous history of malignancy. On presentation vital signs were remarkable for tachycardia (105 bpm) and fever 102.6oF, pulmonary and cardiac exams were normal. Abdomen was tender to palpation in epigastric area and right upper quadrant. Laboratory tests were remarkable for a leukocytosis (16,900 cells/mm 3), alanine transferase 58 U/L, aspartate transferase 41 U/L total bilirubin 1.4 mg/dl. 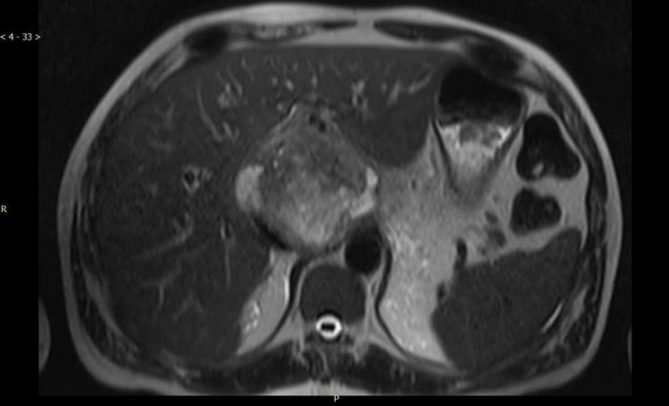 An abdominal ultrasound showed 4.2 cm solid mass in the region of the porta, adjacent to the pancreatic head with no dilatation of the biliary tree or pancreatic duct. 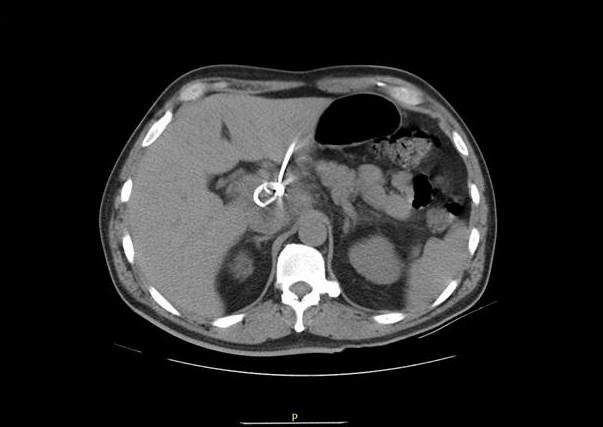 It was delineated by a CT of the abdomen-pelvis that demonstrated an irregular, hypo attenuating, heterogeneous mass in the region of the porta hepatis measuring up to 7.5 x 6.7 x 6.4 cm. Patient was started on Piperacillin/Tazobactam and metronidazole on admission. Patient remained febrile on antibiotics for the first 6 days then he became afebrile. Stool cultures and ova parasite studies were sent and negative, admission blood cultures were negative, serologies for echinococcus and amoeba were sent. Before a biopsy could be performed an MRI was obtained (see image) in order to evaluate the possibility of a vascular process or evidence of septa or daughter cells which would suggest echinococcus both possibilities that would preclude a biopsy. 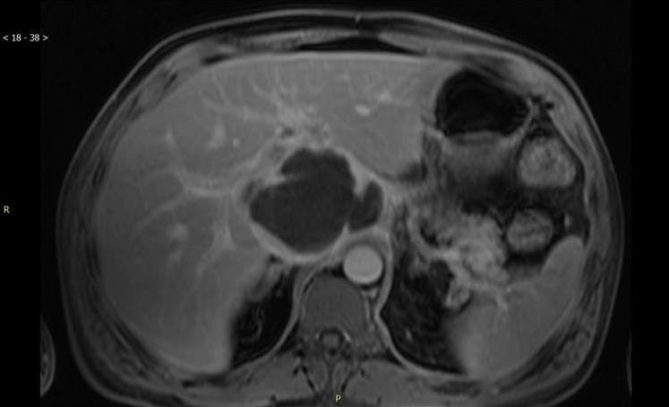 The MRI described an expansile solid and cystic 10 cm by 8 cm by 8 cm porta hepatis mass. CT guided biopsy was performed on hospital day 10 which yielded 30 ml of bloody fluid. A drain was inserted and removed 2 days later as drainage was minimal. On pathology many abundant neutrophils were described but no malignant cells. Gram stain showed no organisms and cultures were negative. Serologies for HIV, hepatitis B and C were negative; alpha fetoprotein levels were normal and serology for echinococcus antibody was negative. The patient went home on hospital day 14 on levofloxacin and metronidazole. Serology for amoabi sent on hospital day 3 was negative but repeat serology on hospital day 13 was positive. Four days after discharge, the patient was seen in clinic and was asymptomatic. As he had completed a course of metronidazole for amoebiasis, his antibiotics were stopped. He was then given a luminal agent paromomycin in order to eradicate intraluminal cysts. An outpatient colonoscopy was scheduled. Entamoeba histolytica is a protozoan responsible for causing amebiasis. Although it is usually asymptomatic, it can present with amebic dysentery and extraintestinal disease such as liver abscess, or rarely pulmonary, cardiac and brain involvement. High rates of infection are seen in India, Africa, Mexico and parts of Central and South America. Our patient was most likely infected 5 months prior to admission while in Ecuador and was symptomatic for 10 days. Serologies were negative at the time of admission but repeat serologies were positive 10 days later. E. histolytica antibodies and are usually present (99% of patients) at clinical presentation. However several studies have shown that these antibodies can be negative in the first 7 days 3 and therefore a repeat serology test should be pursued if the clinical suspicion for E. histolytica remains high, as in this case. PCR and antigen testing are also available for the abscess aspirate and is positive in 2/3 to 100% of cases. Fig. 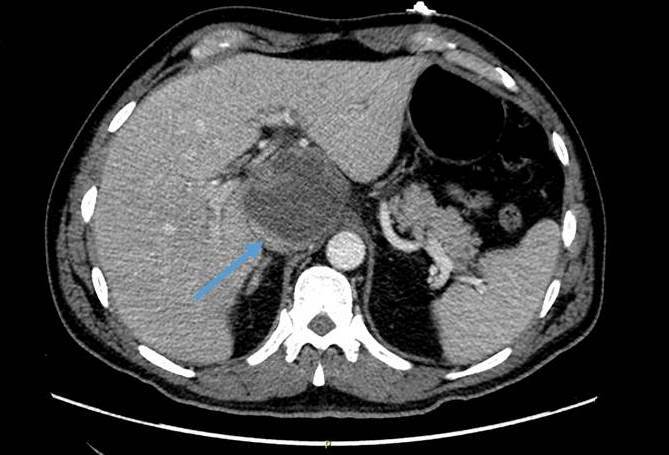 1 – CT 1/13/18 shows fluid collection in caudate lobe of liver compressing the adjacent IVC (arrow). Fig. 2 – MRI T2 image shows heterogenously high signal in region of caudate lobe. Fig. 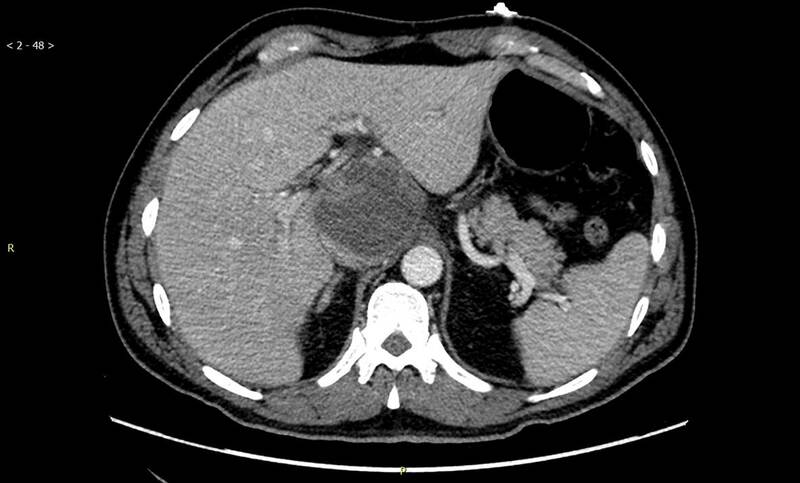 3 – MRI T1 post-contrast image shows peripheral enhancement compatible with abscess. Fig. 4 – CT guided placement of drainage catheter.